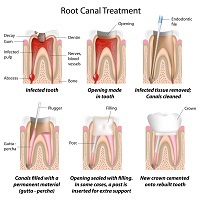 Root canal therapy is a procedure where infected, injured or dead nerve tissue (also known as the dental pulp) is removed from your tooth. Once removed, root canal filling material is put in its place. A successful root canal treatment allows patients to keep the tooth pain free, instead of having to pull it out and potentially decide on an artificial tooth replacement option to avoid drifting of the teeth or potential jaw problems.